Dangling icicle lights that emulate the real thing have been an American staple for the past decade. 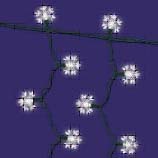 One of many types of outdoor Christmas lights, cascading white icicle lights have enabled people to create their own private icy winter wonderland regardless of whether they live in the snow belt or in parts of the country where they will never, ever see a single snowflake. Did you know that the typical little white icicle lights are far from the only choice in this category? In the last few years these icicle lights have evolved into a whole new generation of colorful LED lights in a variety of shapes and sizes. These days you can opt for icicle lights composed of a multitude of little snowflakes or even little stars. On top of that you can select LED icicle lights in a variety of tempting colors to complement a color-coordinated display of outdoor Christmas lights. Color choices are potentially endless but in addition to white, red and green, unusual color schemes with purple and even blue Christmas lights are showing up nationwide. Eye-popping and unusual, the newer LED lights can cost a fair amount more than traditional incandescent outdoor Christmas lights. But with reported energy savings of up to 88%, these new little LED lights have garnered plenty of attention and sold well. So, as you plan your outdoor Christmas lights for the coming year, don’t be afraid to venture into something just a bit different. Experiment with unusual, non-traditional colors, and add variety to your display by considering some of the new shapes and designs that will be arriving in local stores this fall. Christmas in America is not just little white icicle lights any more.